This year has flown by and I must say, finding time in the busy season to sit down and up date things in length is often tough. We have had a fairly wet year so far and that led to slow fishing in April but great fishing in May and June. July has continued to be fairly cool and wet providing for a summer of good trout fishing. 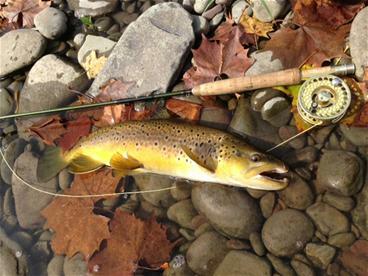 Look for good fishing in the mornings on the freestone streams for the next few weeks. The early hours of the day will often provide the best fishing and fish are often looking up feeding on spinners, midges, caddis and terrestrials. You may also find sporadic trico and olive hatches in the morning on some of the Pocono steams. Tailwater fisheries such as the Delaware and Pohopoco will continue to provide good fishing and hatches through out the Summer and into the fall. These rivers benefit from deep lakes the provide super cold water through the summmer. The fish and fisherman will enjoy the consistant water temperatures and insect activity all summer long. This winter was sure a long one and spring hasn’t been much different. Heck, we just had snow April 16th! The water through out Eastern, PA is high and cold and is just now starting to see the 50 degree mark. Over the past couple of weeks the Bushkill in Easton has been the most consistant stream due to it’s limestone spring creek characteristics. We have hooked some nice wild fish and many stocked rainbows from 13th street up to Penn Pump. Carl and Abby Hittenger caught back to back slammers the other day to start off the 2014 season. All fish are eating size 18 pheasant tails and killers. 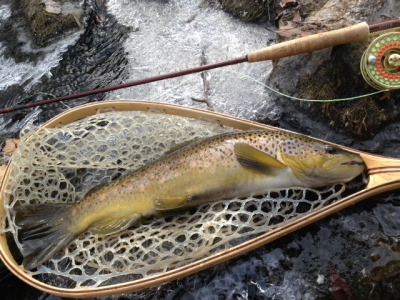 The Martins Creek has been fishing fair with wild browns taking 14-16 copper johns and 16-18 bead head pheasant tails. The Brodhead and McMichaels are just starting to pick up with a few Olives and Hendricksons starting to pop with the hatching early season stones. Fishing should definately pick up the last two weeks of April and look for strong hatches and lots of water for the next couple of weeks. Heading to the Delaware on the 21st of April. Got to go vist the big fish and lots of friends for a couple of weeks. I’ll send pictures! Fishing has been slowed lately due to the extremely cold weather. Many of the local streams have ice on the edges and across the slower pools. When the water warms fishing should be pretty good. Before the deep freeze we had good fishing on Martins Creek and in the Private Club water on the McMichaels. Fish on the Martins were all over Prince Johns and GPS Stone Fly Nymphs. Size 14-16 in Copper and Wine for the Johns and Size 12 GPS in Yellow. Chris Miller and I had a great day with 14 fish to the net ranging from 11-17 inches and they all fought hard. On the McMichaels Dr. Ed was out in search of the Molly Gurgle huge trout in Dr. Eds terminology. He found it! 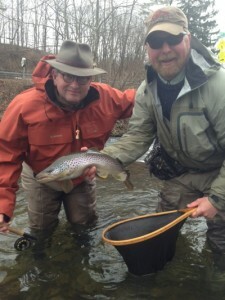 Ed had wild browns from 11-18 inches and a few club rainbows that where 18-24 inches. Unlike most days, the Browns where all on eggs and the rainbows were all taking the Prince John. If you are wondering what a Prince John is, you may want to check out the new flies in the web store. Can’t wait for the water to warm up a bit. Looks like next week may be good according to the long range forcast. Although the weather has been cold the fishing has been good for this time of year. Low water is still making fish skittish and limiting where fishing is productive. Hopefully we get some more much needed rain or snow. The creeks could use it and so could the fish. Predators are loving these low water conditions. If you get out try fishing eggs or small nymphs low and slow along the bottom. Dave Chen and I had good luck with sucker spawn this weekend. Dave landed several nice fish in the club waters and when the water warmed up a bit so did the fish. Good job Dave. Fishing has been pretty good in PA even with the low water. 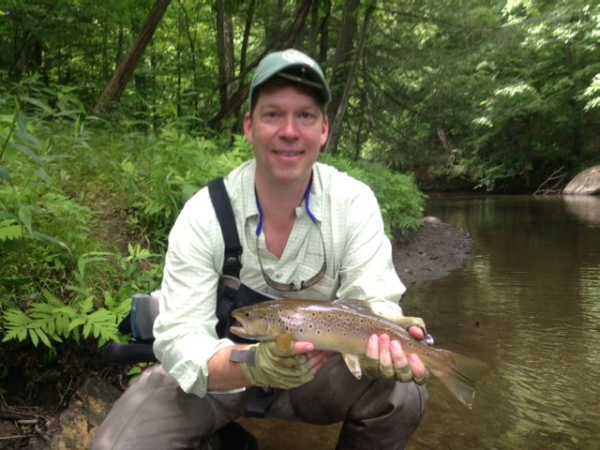 We have had good success nymph fishing on the bigger creeks like the Brodhead and the Bushkill in Easton. Small Copper Johns, Pheasant Tails and eggs are all catching fish. You may also see a few remaining olives on the nicer days. At this time the water is low but it looks like we are going to get some much needed rain. When the water comes up, the fishing will get better.